How does your pickup and delivery service work? 3-hour service available 7 days at no extra cost in store. Order must be in by 7 AM to 12 PM Monday to Friday & 8 AM to 12 PM Saturday and Sunday. We offer FREE PICK-UP and NEXT DAY delivery service Monday to Friday. How do I prepare my clothes for pickup? It is preferred that all of the items are contained in reasonably sturdy bags. Special service items should be in a separate bag and labeled with instructions. When placing your order give instructions where you would like your order to be picked up and returned. Instruct us as to where to pick up and deliver your order. 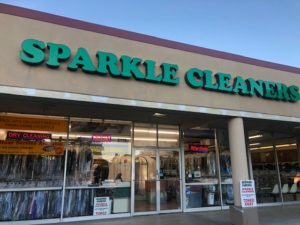 Reminder that Sparkle Cleaners is not responsible for the safety and security of orders left unattended during the pick up and delivery process. We accept cash and all major credit cards upon the completion of your order. Credit card orders can be paid upon delivery to the driver or via phone. Yes we do. Call to ask about pricing for custom items or check our pricing page. Yes, check our pricing page for details. How long does it take before my cleaning is ready?